We love interviews, and how fun is it when one author interviews another one? It makes for a major good time. We have a special treat for you today, and another coming up on Monday. 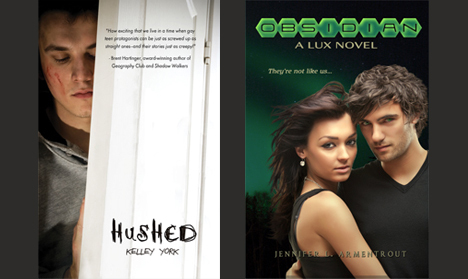 Today, Hushed author Kelley York’s interview with Obsidian author Jennifer L. Armentrout. And Monday? You guessed it. Jennifer L. Armentrout’s interview with Kelley York. You have books focusing on everything from sci-fi to Greek mythology and paranormal, so you’re all over the place and it’s awesome. What sparks your ideas? Are you more of a plot idea first, characters later sort of writer? Or do the characters come first? It’s really weird, actually. Sometimes it’s something really random that sparks an idea–like a song or an overheard conversation, or just the crazy stuff that filters through my brain when I’m on the elliptical ( I get most of my ideas doing that). The characters usually come first and then plot. HALF BLOOD released at the end of October, and OBSIDIAN released only a month later at the beginning of December! Not to mention, you have more books coming out all through 2012 for multiple series. I am in awe of how you not only get so much writing done, but how you manage a blog and Twitter, and publicity on top of that. How do you do it? Do you have a secret clone? I have three clones. Haha. Well, some of these books have been written over the course of a couple of years. To give you an idea, Half-Blood was written in late 2007/early 2008, Cursed and the first adult novel was written in 2009/2010. Pure was written in 2010. This past summer/fall though, I did write 5 books in four months, which by the way, was absolutely insane and I probably will never do that again. I don’t blog every day, only when I have something to say, and Twitter is just fun, so I find it a much needed distraction. You also have an adult series from Entangled Publishing coming in March. Can you share a little about that? Sure can! It centers around fallen angels and the Nephilim, demons, and one of my favorite creations of all time—dead heads. Lily Marks is the made character and she squares off against Julian, a fallen angel who pretty much will stop at nothing to have her. It’s definitely an adult romance and was a lot of fun to write. So many readers who normally aren’t into sci-fi have picked up OBSIDIAN and fallen in love with it. What challenges did you face when writing OBSIDIAN in making the aliens fresh, unique, and fun even for non-science fiction fans? Before I came up with the alien life form, I kept picturing them as giant insects. Yep, Daemon was a giant, brain eating insect for awhile until I worked out what I wanted them to be. Some people have caught on to the names and their Latin meaning. My aliens have been around a long, long time. The made challenge was that I didn’t want it to be too heavy on the sci-fi, so I did struggle with that a little bit. Have your own question for either author? Don’t be shy! Oooh~ Great interview! I LOVE the teaser!! omg that was awesome! ilove the teaser…. but i love love this book sooooo much! !